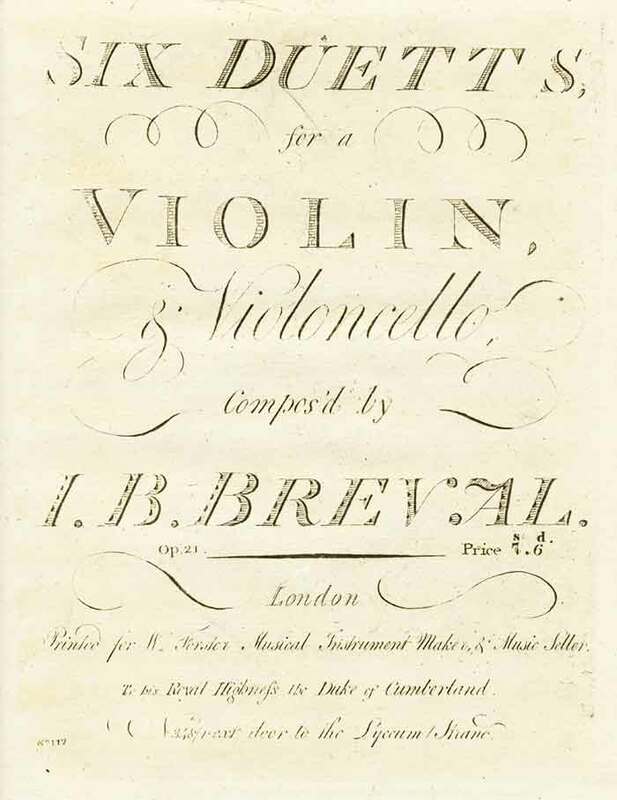 Bréval: Three Duetts for Violin and Cello, Op. 21, No. 4 in F Major, No. 5 in E Minor and No. 6 in D Major. Facsimile of edition ca. 1795 (parts only) and modern performing edition, score and parts. The Six Duetts, Op. 21 for violin and cello were written ca. 1795. Unlike the other duets in these editions, they are originally for violin and cello, not two violins. Duett No. 4 in F Major has two movements: the first is a sonata form, and the second movement is marked Rondo. Duett No. 5 in E Minor has two movements: the first is a sonata form, and the second movement is an Aria with three variations. Duett No. 6 in D Major has two movements: the first is a sonata form, and the second movement is marked Rondo Presto.